Migos on ILOVEMAKONNEN Coming Out as Gay: "That's Wack, Bro"
Singer-rapper and self-professed fashion icon ILOVEMAKONNEN came out as gay on Twitter last month, encouraging fans of his work to "spread the love and stop the hate." Unfortunately, fellow ATLiens Migos didn't have as positive a reaction to the news. And so I'm surprised by Migos' reaction when I mention iLoveMakonnen, the local MC who just came out as gay on Twitter. "Damn, Makonnen!" Quavo bellows after an awkward interlude. I mention support I saw online for Makonnen's decision. "They supported him?" Quavo asks, raising an eyebrow. "That's because the world is fucked up," says Offset. "This world is not right," Takeoff says. "We ain't saying it's nothing wrong with the gays," says Quavo. But he suggests that Makonnen's sexuality undermines his credibility, given the fact that "he first came out talking about trapping and selling Molly, doing all that." He frowns. "That's wack, bro." UPDATE (2/8, 5:10 p.m. EST): In response to this story, Migos have now shared the following statement via Twitter, clarifying their comments. 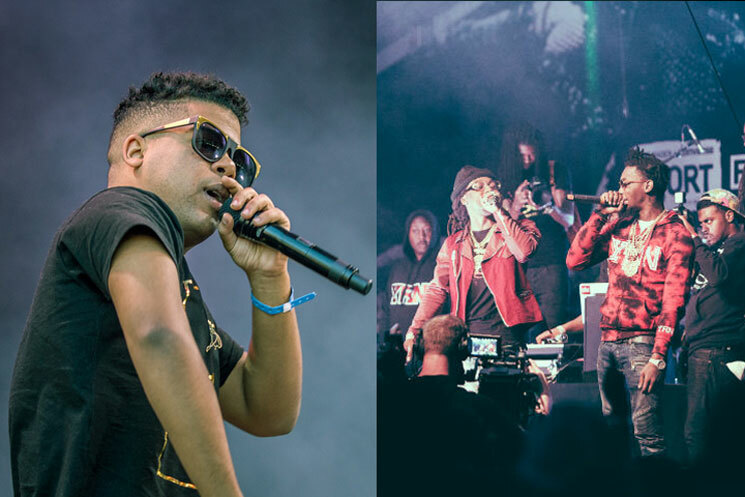 Migos and Makonnen teamed up to record a remix of the latter's "Whip It," which appeared on his Drink More Water 5 mixtape.